"A delicious, colorful blend of summer's fresh fruit topped with citrus dressing and finished with toasted pecans." In a large salad bowl, gently toss together the watermelon, cantaloupe, pineapple, strawberries, peaches, grapes, and kiwi until thoroughly combined. Combine the water and orange juice, limeade, and lemonade concentrates in a small bowl. Pour the dressing over the fruit salad. Gently toss, and sprinkle the salad with toasted pecans. Serve salad scooped on lettuce leaves. 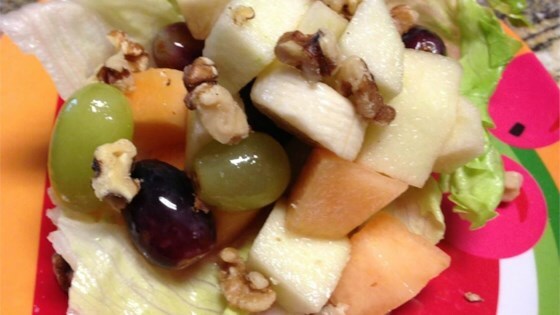 A rainbow of color and flavor, this truly is the Perfect Summer Fruit Salad! The nice thing about the fruit salad is, you can increase or decrease the amount of fruit and you can vary the fruit according to family preferences. If your family likes one fruit more than another or if you have a different selection of fruit, it would be okay to add what is available. Also, if you would like a fruit vinaigrette dressing I think adding an additional flavor is quite okay. A raspberry walnut vinaigrette dressing would be very nice. Or, if you prefer, you don't need to use any dressing. In this case I feel the fruit salad can stand on its own. We really liked this! I did substitute raspberries and blackberries for the kiwi(not a huge fan). The pecans really add to the salad. 5 Stars Question: Can I make this ahead of time and keep in the refrigerator for at least 24 hours? I used the fruit that I had on hand, and the dressing was really good-I liked the idea of serving in lettuce cups also.